SAN FRANCISCO — Converged infrastructure systems from major vendors that combine server/networking/storage into one chassis are often huge appliances aimed at large enterprises — think of HP’s ConvergedSystems or VCE’s vBlocks. VMware has decided to make converged systems affordable for the mid-market with a new family of appliances and a different way of construction: It provides the software stack, while OEM hardware makers provide the physical parts. Branded as EVO:RAIL, the appliances were announced Monday at VMworld here. The hardware partners include Dell, EMC, Fujitsu, Inspur, Net One Systems Co. and Supermicro, who will assemble 2U-sized packages of compute, network and storage that slide into a rack. Running on a 100 per cent VMware stack, the appliance is being billed by the company as a cornerstone to creating a software-defined data centre. It will include VMware vSphere, Virtual SAN, and venter Log Insight. The appliance also includes a user interface for the purpose of created virtual machines, marrying them with the required associated networks and storage vaults. VMware CEO Pat Gelsinger says IT organizations should move towards software-defined data centres. 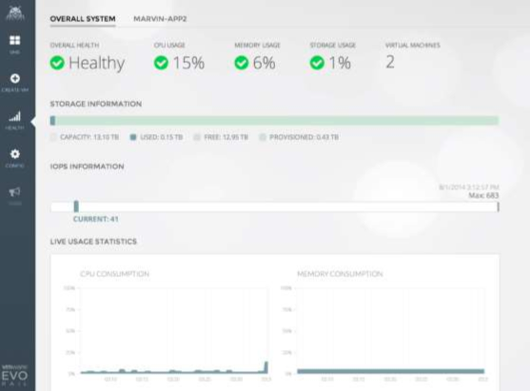 VMware is pitching the benefits of the appliance as a quick time to create your first virtual machine, being able to scale up and add more virtual machines as needed, requiring zero downtime for VMware software updates, and simple virtual machine lifecycle management. While different partners are involved in selling the EVO:RAIL hardware, all of them will be sticking to VMware’s recipe for the appliance. It will run dual six-core Intel Xeon E5 CPUs, up to 192 GB of memory, offer a mix of SSD and spinning disc storage, a dual power supply, and will offer 24 hot-swappable 2.5-inch drives. 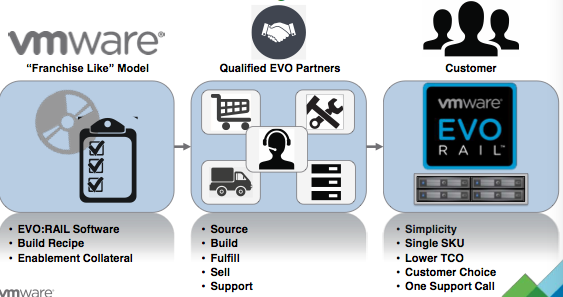 EVO:RAIL is aimed at customers in the mid-sized business to enterprise segment. Businesses that operate remote and branch offices in government, healthcare, education, insurance, oil and gas, and retail sectors are included in the target market. The appliance will be used for deployment, configuration, and management of virtual machines, Van Der Walt says. A graphical user interface is provided to complete those tasks with a few mouse clicks and text-entry fields. Technical operators will be notified of problems like overlapping IP addresses by little red dots that appear as alerts. EVO:RAIL is slated to be made available by VMware’s hardware partners in the second half of this year. Pricing will be set on a single SKU and provided independently by the partners. The second entry into the EVO family is also being teased at VMworld. EVO: RACK will be targeted at larger enterprises, and designed to run on data centre racks. It will be compatible with Open Computer Project-based hardware and OEM servers.